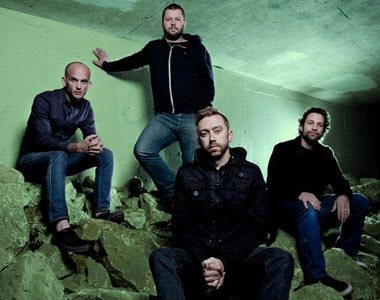 Rise Against Biography, Discography, Music News on 100 XR - The Net's #1 Rock Station!!! The Alternative-Rock four-man outfit Rise Against, formed in late 1999 in Chicago, Illinois USA, when vocalist Tim Mcllrath and bassist Joe Principe decided to begin playing music together; the pair enlisted Dan Precision to play guitar and almost a year after they first met, found a drummer that exceeded their expectations, Colorado-native Brandon Barnes. The group recorded a demo which landed them a deal with well-respected indie label, Fat Wreck Chords, who released the band's first full-length disc, "The Unraveling", in spring 2001. After two years of solid touring, the foursome cut their sophomore album, "Revolutions Per Minute", which was released in December 2002. The disc, recorded with new guitatist Todd Mohney, climbed into the top 40 of the Billboard's Independent Albums chart. 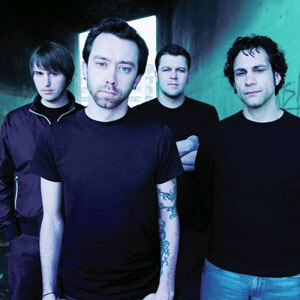 Rise Against amicably left Fat Wreck and signed to DreamWorks/Geffen in December of 2003. The following spring Mohney was fired; guitarist Chris Chasse stepped in as a permanent replacement in time to record Rise Against's major label debut, "Siren Song Of The Counter Culture"; the 12-song set hit #3 on Billboard's Top Heatseekers list upon its August 2004 release, it also reached the #136 spot on The Billboard Top 200 Albums chart and yielded three Modern Rock charting singles including the top 20 hit "Swing Life Away", "Give It All" and "Life Less Frightening". The group spent ample time on the road supporting the release, including successful runs on the Warped Tour as well as opening shows for Bad Religion. Rise Against's fourth album, their second on a major label, "The Sufferer And The Witness", released in July 2006, blasted their way straight into the top 10 of The Billboard 200; it was prefaced by the Hot Modern Rock top 20 hit "Ready To Fall"; the follow-up singles, "Prayer Of The Refugee" and "The Good Left Undone" charted higher, peaking at #7 and #6, respectively, on the Billboard's alt-Rock radio chart. After their past two albums went on to sell just shy of half a million copies in the States, the Chicago-based outfit's next effort, "Appeal To Reason", released in October 2008 , quickly bulleted into the top 3 of The Billboard 200 and earned the platinum status. This was the first album with new comer guitarist Zach Blair, who replaced Chris Chasse. The CD, which made a #1 debut in Canada, spun off three top 5 U.S. Hot Modern Rock smash singles: "Audience Of One", "Re-Education (Through Labor)" and "Savior" with the latter two both reaching #3. Rise Against issued its next full-length disc, "Endgame", in March 2011, it peaked at #2 on The Billboard 200 and hit #1 on the Top Canadian Albums list. During the year the group placed three singles, "Help Is On The Way", "Make It Stop (September's Children)" and "Satellite", in the top 10 of both Alternative and Active Rock charts. The final single, "Wait For Me", reached #14 on The Hot Rock Songs in early 2012.